Three practitioners at Bikram Yoga Capital Area represented the state of Michigan in this year’s USA Yoga MidWest Super Regional Championships in Chicago, IL, this past weekend. BYCA students Lauren Anastos, Lindsay Gray, and Ann Chrapkiewicz performed their routines with steadiness, focus, and calm. They all had a very enjoyable, positive experience! The best possible outcomes for all. As a group, the three of them did not pressure themselves to “perform” or compete, nor to train beyond their capabilities. They demonstrated the natural places in their yoga practice, as well as the emotional control needed to breathe normally, in stillness, on a stage, in yoga postures! Click here to watch her live Super Regionals demonstration routine. And here for her thoughtful blog about why she participated. And here for her inspiring blog about how yoga helps her long-distance running. Click here to watch her live demonstration routine from the Super Regional event. 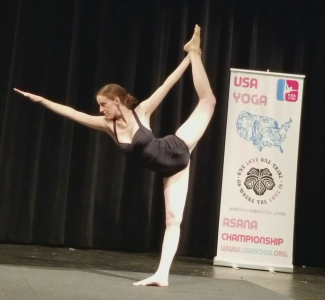 Ann received the 3rd highest score in the “Super Region”, and as the 1st place scorer from Michigan, Ann will proceed to the USA Yoga National Championships. Stay tuned for more information on that event….coming soon! View the full scoring results for the MidWest Super Regional event here. USA Yoga is a non-profit organization dedicated to developing and promoting Yoga Asana as a sport. Rajashree Choudhury founded the organization to inspire youth to cultivate a yoga practice. USA Yoga is not affiliated with any particular yoga school or tradition and seeks to include practitioners of all hatha yoga backgrounds. Read more about its purposes and Rules structure here. In yoga we learn that whatever we bring to a situation determines the nature of how we operate in that situation. Many people see asana championships as competitive, but this is a limited way of seeing them. B.K.S. Iyengar, one of the most well-known yogis in the past century, supported asana demonstrations and championships as a way to inspire others to take up a hatha yoga practice (read his letter of support here). For more on my personal philosophy and the approach of many participants, read here.